O'Keefe & Merritt - Wedgewood - Roper - Maytag - Tappan - Western-Holly Safety Valves - TS-7 "Pickle Style"
The pilot light is on but my oven will not turn on! My oven turns off by itself while I am baking. Our oven was working­­ fine then just stopped for no reason! We didn't realize our broiler quit. Our food is raw. you need your stove the most. The First Manual of its Kind! Also Known As the "Pickle Valve". antique stoves and heating units throughout the 1940s-50s. the TS-7 safety valve system in your stove. Eliminates Guesswork and Flawed Evaluations. Do-It-Yourself Analyze Quickly, Safely and Easily. Location of Pilot Adjustments with pictures and explanation. Causes of Safety Valve Failure with actual interior photos never before published. Pilot adjustment for TS-7 Valve on Thermostat with photo. Service Procedure for Safety Pilot Adjustment. Various Pilot Valve Styles photos. Why It Is NEVER a good Idea to purchase a 'Used' TS-7 Safety Valve. 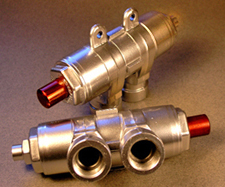 Various TS-7 Safety Valve Styles pictured. Removing the TS-7 Safety Valve from Your Stove. Where to get antique Grayson Robertshaw Safety Valves Serviced Accurately and Quickly. With or Without Side Tap Pilot. Make Sure Your Holiday Meals are a Success! The New TS-7 Manual is Easy to Understand. It will walk you through everything you need to know. Furthermore it will point out exactly how to troubleshoot and analyze problems for the TS-7 safety valve swiftly and with complete accuracy. We are heading into a big Holiday cooking season . TS-7 antique stove safety system. >Invest in Yourself. The knowledge you gain lasts for a lifetime. All procedures are charted out with the utmost of safety so you can proceed with full confidence. Keep it on hand ... Use it over and over again. Please be sure the Safety Valve pictured is the type you have in your stove before ordering and that TS-7 is stamped on the valve. *This is not a repair manual. 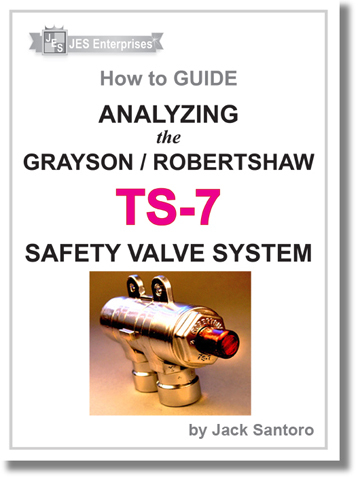 This manual is for analyzing the actual problems with the TS7 Valve. If after using this guide you still need repairs this must be done by a qualified rebuilding service. Parts for rebuilding TS7 safety valves cannot be sold to the public. If you need quality rebuilding services at the lowest prices with longest warranty contact: J.E.S. at toac@sbcglobal.net. *All sales final on electronic and printed materials. Save! no shipping charge on pdf Guides. 1. Receive Link and Password code by email. Quick delivery, email takes only a few minutes. Download to device with Printer...check paper and ink. When you receive your email ... click file to open with 'Reader' to Print!